Planning a romantic getaway or date night can be tough. We’ve all been there. Running around frantically in search of the perfect location. Don’t worry, we have you covered. We’ve compiled a list of the most elegant and romantic local places that can help even the most clueless of couples celebrate a special romantic day in style. Here are our 15 favorites. Set in the magnificent Boynton Canyon of Sedona, Enchantment Resort has world-class views and amenities that can spice up any date night. The resort is nestled in an arena of red rocks that showcase the natural beauty that has made Sedona a top romantic destination. In addition to the views, Enchantment has so many amenities that it feels like it could be on an episode of “The Bachelor.” There are spa services, tennis courts, hiking trails, and stellar dining options. The Wrigley Mansion was famously home of chewing gum tycoon William Wrigley Jr. This 16,000-square foot mansion has become a Phoenix landmark for it’s luxurious floor plan and 360-degree city and mountain views. Geordie’s Steak, an onsite restaurant location, has a perfect atmosphere for couples. In addition to the views and live piano, their vibrant Sunday brunch includes bottomless champagne. This beautiful 27-acre resort and spa is located amid the serene McDowell Mountains in Scottsdale. Couples can take advantage of this hotel’s many date friendly activities. The world-class Spa Avania features 19 treatment rooms and was named one of the “Best Spas in the World” in 2014 by Condé Nast Traveler. Their romantic Gondola rides include a cruise through the resort’s seven-acre lake and serenades from classically trained singers. Venice has some competition. The Farm at South Mountain is a combination kitchen, café, restaurant and wine bar. It’s also an ideal spot for couples that fancy a picnic. The Farm Kitchen, the original restaurant at the Farm property, includes a walk-up counter where customers can choose their lunch. Their menu includes fresh sandwiches, soups, salads, and baked goods. After choosing their meal, couples can take a picnic basket on a stroll through Pecan Grove before choosing a comfortable spot for a picnic lunch. Top of the Rock’s panoramic views of the Valley of the Sun make for an unparalleled date night setting. Located at Phoenix Marriott Tempe at the Buttes, this elegant restaurant sits atop a hillside butte and has breathtaking views of the city and its desert sunsets. Their Southwestern menu, cocktail blends, and delectable desserts have helped this restaurant set the bar for romantic dining in Arizona. 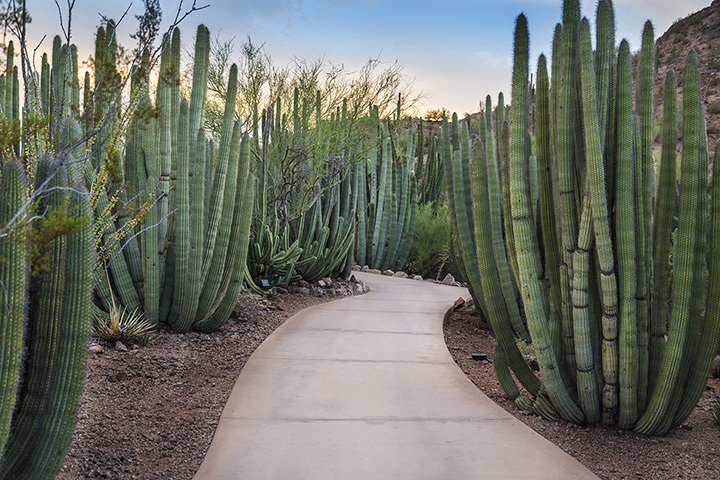 This Desert Botanical Garden is a 140-acre desert oasis featuring over 4,000 species of plants. Couples can experience the diverse collections of desert flora and fauna by walking through some of the many trails and rotating list of exhibits. The permanent trailside exhibits include the world-class Cactus & Succulent Gallery and the Ottosen Entry Garden. Additionally, the garden has many rotating exhibits that illuminate the natural beauty of the desert and can add a spark of romance to the renowned Arizona sunsets. If you’re searching for a romantic weekend getaway, look no further than Loews Ventana Canyon. Set deep in the Catalina Mountain Range near Tucson, this hotel’s relaxing setting makes it a prime location for those seeking nirvana. The desert ambiance adds to an impressive list of accommodations—including private balconies, two swimming pools, yoga classes, and luxurious restaurants. Postino has grown from a small, rustic restaurant to a fast-growing Bruschetta and wine empire. They have five valley locations each set in comfortable, restored historic buildings. Their relaxed atmosphere pairs well with their popular menu items. They famously offer a great date night package—a $20 Bruschetta board and bottle of wine on Mondays and Tuesdays. T. Cook’s has an adventurous menu and a romantic ambiance that complement any date night. Located at the Royal Palms Hotel, this Mediterranean restaurant has a diverse collection of seafood, steaks, and wines. The high-vaulted ceilings, cozy patio, and mesmerizing fireplace all contribute to an idyllic setting. Add in panoramic views and some delicious cocktails and it’s clear to see how T. Cook’s has gained their stellar reputation. This is an easy one. Scottsdale Civic Center Mall is home to the LOVE statue—a large statue with big red block lettering spelling out every romantic’s favorite word. This landmark is a popular destination for Instagrammers and anyone looking to profess their love to a significant other. This park also has gorgeous lawns and fountains perfect for a romantic stroll. The park is in Old Town and is surrounded by several shops and restaurants. SMoCA is a cultural hub in the middle of Old Town Scottsdale’s arts district. This museum houses many art exhibits devoted to showcasing the worlds of music, dance, literature, performance, and film. Their outdoor courtyard features the work of local artist James Turrell. Turrell’s Knight Rise invites visitors to view the sky through an elliptical opening in the ceiling and creates the illusion that the sky is descending upon space. The museum is full of interesting works and are inviting to couples seeking to enjoy a quiet and thought provoking setting. The 1920s-style cottage is as the ultimate spot for any candlelit dinner. House of Tricks has many alluring date night qualities. There’s the vintage stone fireplace, wooden deck, outdoor patio bar and tree covered lawn. With a mix of contemporary food and fine wines, the meal backs up the setting as being one of Tempe’s best. Camelback Mountain remains one of Arizona’s most well known landmarks. The Sanctuary is a 53-acre resort nestled near Camelback’s base. This luxurious hotel is a refreshing area for couples to unwind in a private setting. The spa includes many Asian-inspired treatments and a meditation garden. Their outdoor pool houses many casitas and offers scenic views of Camelback. Unwind, sit back, and enjoy. This mountaintop restaurant has some of the most incredible views of the Valley. Different Pointe of View is perched atop North Mountain in Phoenix. Their dining area has floor-to-ceiling windows that provide a panorama of Phoenix’s skyline and sunsets. After a multi-million-dollar renovation, this is one of the most in-demand restaurants in the state. Grabbing drinks or seeing a movie is a question that has plagued many a couple seeking a fun date night. Fortunately, FilmBar in downtown Phoenix has you covered. FilmBar is a theater that specializes in independent, foreign, and cult films. It’s also a full-scale beer and wine bar. This small building has gained quite a following as being a great date night locale. Quality films are just as important as a quality experience at FilmBar.